Gustav Robert Kirchhoff was a German physicist who made significant contributions to the fundamental understanding of black-body radiation emitted by heated objects, spectroscopy, and electrical circuits. Gustav Kirchhoff was born on 12 March 1824 in Konigsberg, East Prussia where his father, Friedrich Kirchhoff, worked as a law councilor. Friedrich Kirchhoff had a very strong sense of duty to the state of Prussia. His mother was Johanna Henriette Wittke. The Kirchhoff family belonged to an intellectual community of Konigsberg that was flourishing and Gustav was considered the most promising of his parents’ children. He was raised with the mindset that serving the state was really the only open option for him. In the state of Prussia, university staff and professors were considered civil servants and so his parents believed that this was the best place for him since it was where he could put his intellect to work to serve his state. 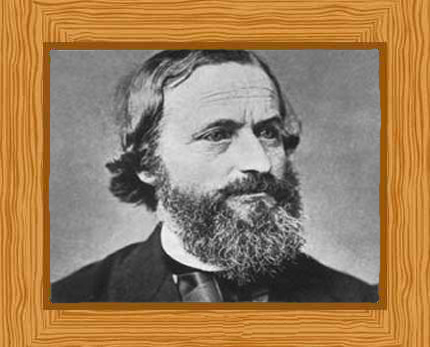 Gustav Kirchhoff excelled in school and given his academic aptitude, his career flowed naturally. He was educated in Konigsberg at the Albertus University, which was founded by the first Duke of Prussia, Albert in 1544. Kirchhoff attended mathematics-physics seminars from 1843 to 1846 held by Franz Neumann and these had a positive influence on him. Neumann was interested in mathematical physics and was working on electrical inductions, having just submitted the first of two major papers he wrote on that subject in 1845. While he was studying under Neumann, Kirchhoff made the first of many outstanding research contributions that were related to electrical current. In 1845, he announced laws (later to be known as Kirchhoff’s Laws) which allowed the calculation of currents, voltages and resistances in electrical circuits that had multiple loops. This further extended German mathematician Georg Ohm’s work. Kirchhoff’s current law (1st Law) stated that current flowing into a node (or a junction) must be equal to current flowing out of it. Kirchhoff’s voltage law (2nd Law) stated that the sum of all voltages around any closed loop in a circuit must equal zero. He graduated from university in the year 1847 and moved to Berlin, working as a Privatdozent (an unpaid teaching position). The economic and social conditions were rather fragile in the German Confederation at that time. Fortunately, Kirchhoff was in a privileged position and was unaffected by the events of the state so he pressed on with his chosen career. In 1847 he gave a correct understanding of how the theory of electric currents and electrostatics should be combined. Kirchhoff was appointed a professorship in 1850 in Breslau and he met Robert Bunsen who was working there temporarily. They became lifelong friends. Bunsen returned to the University of Heidelberg in 1852 and he arranged for Kirchhoff to obtain a position at Heidelberg as well, accepting the position as professor of physics. Aside from working with electricity and currents, he also made major discoveries in the field of chemistry. In collaboration with Robert Bunsen, they developed the field of chemical spectroscopy, which splits light into different wavelengths to determine the chemical composition of objects such as stars and elements. Kirchhoff and Bunsen used spectrum analysis to study the composition of the sun and in the course of their investigations they discovered the elements cesium (1860) and rubidium (1861). With the use of a spectroscope they had invented together, they managed to identify these two alkali metals that the world had no previous knowledge of. Their discoveries marked the beginning of a new era, introducing a new way to look for undiscovered elements. 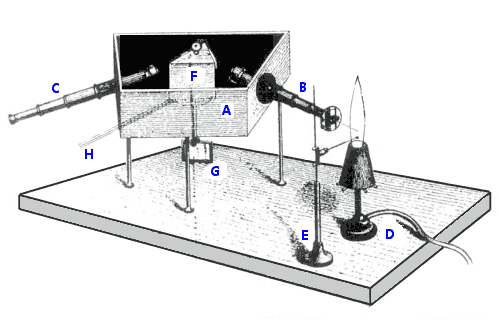 KEY: (A) Box, colored black on the inside; (B) & (C) Telescopes; (D) Bunsen Burner; (E) Sample Holder; (F) Prism; (G) Mirror; (H) Handle to rotate prism and mirror. Kirchhoff was the first to explain the dark lines in the sun’s spectrum stating that they were caused by cooler gases in the sun’s atmosphere absorbing particular wavelengths of sunlight. These dark-lined spectra are now called absorption spectra. Kirchhoff also proposed his law of thermal radiation which was a general statement equating emission and absorption in heated objects. In 1857, Gustav Kirchhoff married Clara Richelot who was the daughter of Friedrich Jules Richelot, his mathematics professor in Konigsberg. Together, he and Clara had two daughters and three sons. Clara died in 1869 and he was left to raise his children. This was made all the more challenging since he had a disability that forced him to use crutches or a wheelchair most of the time. In 1872, he married Luise Brommel, the superintendent in an ophthalmological clinic. Kirchhoff had numerous offers from other universities but he was quite happy and contented with Heidelberg so he turned down all offers. However, his health continued to fail him and he realized that the experimental side of the subject that he so loved was becoming impossible for him to accomplish. In 1875, he returned to Berlin where he became chair of mathematical physics. This allowed him to teach and conduct research without having to carry out any experiments. His best known work is the four volume “Vorlesungen über mathematische Physik” (Lectures on mathematical physics), published in 1876. He died on 17 October in 1887 aged 63 and his final resting place was in St. Matthaus Kirchhoff Cemetary in Berlin. His grave is just a few meters away from those of the Brothers Grimm.